Do the Mediterranean and Strait of Gilbraltar have scientifically explicable different salinities, flora and fauna? I am curious about a phenomena (supposedly confirmed by J. Cousteau) that is said, by a Facebook page, to support some quotes in the Quran. 9- He has let free the two seas meeting together. 20- Between them there is a barrier which they do not transgress. 55-Gracious, 19-20 A famous French oceanographer, J. Cousteau, gives the following account as a result of his studies in water barriers: J.Cousteau “We studied the assertions by certain researchers about barriers separating seas, and noticed that the Mediterranean Sea had its own salinity and density and housed autochthonous fauna and flora. Then we examined the water of the Atlantic Ocean and discovered features entirely different from those of the Mediterranean Sea. 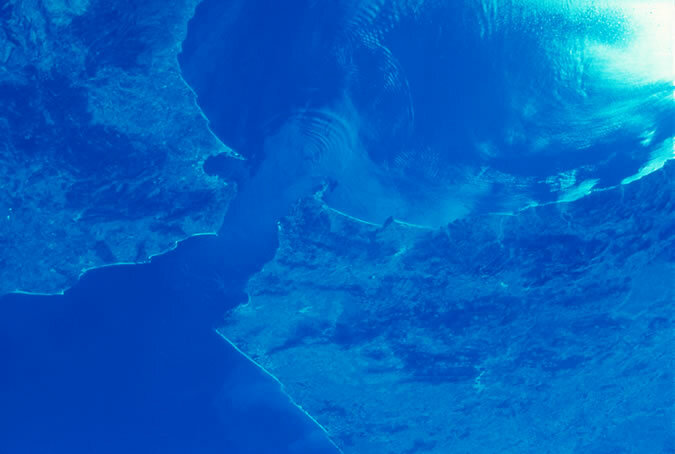 According to our expectations, these two seas that merged in the strait of Gibraltar should present similar characteristics in terms of salinity, density and other properties.Gibraltar The two seas presented different features even though they were adjacent. This greatly puzzled us. An incredible barrier prevented the two seas from coming together. The same sort of a barrier had also been observed in Bab Al-Mandab in the Gulf of Aden connecting with the Red Sea. Subsequent to our observations, further researchers made it clear that the seas which had different characteristics had some barriers.” This fact that astounded oceanographers was revealed 14 centuries ago in the Quran. This aspect, not visible to the naked eye and appearing to be in conflict with the properties of water known to man, was first revealed to men in the Arabian peninsula, men who were not at all experienced in any sense with oceanography. If anyone could confirm this and explain why it is so, I would really appreciate it. Ah, not only are there liars for Jesus, be there are liars for Mohamed... I will note that the facebook page claims that Cousteau converted to islam. That is false. This page (in French) addresses that. High rates of evaporation in the relatively shallow Mediterranean basin cause the water to become saltier, and thereby denser, than the relatively fresh Atlantic water. As Atlantic water is forced through the narrow strait it accelerates and interacts with Mediterranean water. Internal waves (particularly those formed at depths of 60–80 meters) develop where these two different water masses interact. Large, tidally induced pulses of Atlantic water entering the Mediterranean can be seen here as a series of crescents emanating from the strait. These crescents result from interactions of these different water masses at depth. So if anything, there is a massive inflow and mixing. Just not at a biological level as detailed above. Although, Woods Hole Oceanographic Institute has a paper (PDF) where there is indeed mixing. As well as a paper by University of Maryland (PDF). Again, all it proves is that the Atlantic is a different ecological niche than the Mediterranean. Mountains and prairies don't particularly mix (nor the flora and fauna at each environment), although there is a huge range through the middle of the North American continent where they are next to each other. This is a false dilemma. Phenomena can be both uncommon and have natural, rather than supernatural, explanations. Not the answer you're looking for? Browse other questions tagged religious-texts oceanography quran . Is there a place in the world where two oceans meet and they don't mix? Do the key Abrahamic holy books claim that their god is omnipotent, omniscient and omnibenevolent? Does the Quran advise men to beat their wives if they disobey them? Did the Qur'an predict the defeat of the Persians at the Battle of Issus? Did Saddam Hussein have a Quran written in blood? Did the Quran make an impressive prediction about a Roman Victory? Does the 'Quran Constant' tie together several aspects of the Quran?